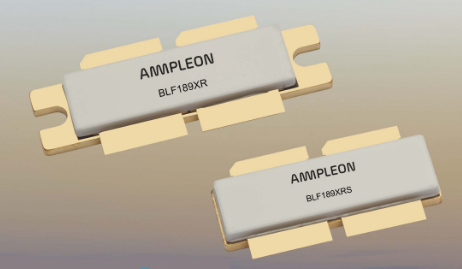 Coinciding with the start of European Microwave Week, Ampleon announced a 1900 W LDMOS power transistor for applications in the 10 to 500 MHz frequency range. Delivering 1900 W pulsed or 1700 W CW output power, the device is capable of operating with a VSWR up to 65:1. The BLF189XR is the latest member of a family of rugged “XR” LDMOS power transistors that are designed specifically for HF/VHF/UHF applications, such as FM broadcast transmitters; plasma generators; medical scanners; particle accelerators; and RF heating, drying and thawing. The XR family is fabricated using Ampleon’s 50 V Gen6HV LDMOS process. The BLF189XRA, optimized to operate across the entire band, i.e., up to 500 MHz. The BLF189XR is assembled in an SOT539A package, with an earless flanged SOT539B package (BLF189XRS) another option. Samples of the BLF189XRB will be available by the end of 2016, with production quantities approximately four months later. The BLF189XRA will be sampled by January 2017, with full release during the second quarter of 2017.